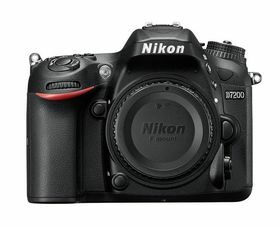 Fast, versatile and fully connected, the sophisticated D7200 delivers sumptuous stills and outstanding video performance. With a host of features inherited from Nikon’s renowned FX models, the D7200 has plenty to offer passionate photographers. This is a camera that’s ready to match the ambition of every photographer who wants to create exceptional images with a lightweight D-SLR system. When it comes to movies, versatile video features and the camera’s lightweight DX body combine to make the D7200 a welcome addition to any production environment. A dedicated menu for movie settings, advanced options for audio control, and the latest generation of Picture Control settings allow superb flexibility. And the camera is compatible with Nikon’s new optional ME-W1 Wireless Microphone, which captures clear sound from up to 50m away. 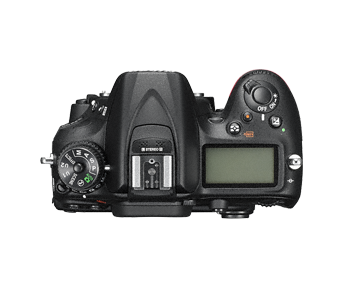 The D7200 is the kind of camera that will inspire you to go further with your photography than you ever have before. With its large DX-format image sensor, EXPEED 4 image processor and an ISO range of 100–25600, images boast an extremely wide dynamic range, low noise, and rich colour gradation. You get print-quality 24.2-megapixel photos of any subject, and clear high definition video footage, even when you shoot in dark conditions. The incredible flexibility this camera offers to shoot without being limited by subject or location is further assured by its pro-grade AF system, inherited from Nikon’s FX-format cameras. Sensitive down to -3 EV (ISO 100, 20 °C/68 °F), the Multi-CAM 3500 II 51-point AF system locks onto your target with incredible precision, even in the dark. Fifteen cross-type sensors in the centre deliver superior subject acquisition, and one centre point is f/8 compatible, enabling more lens/teleconverter combinations. You can shoot at up to 6 fps in DX format, and at up to 7 fps in 1.3x crop, with the camera’s large buffer capturing up to 27 12-bit RAW images and up to 100 high-quality JPEGs in one high-speed burst.² The 1.3x crop mode also gives you the option to extend the telephoto reach of your NIKKOR lens, and have the AF system’s 51 focus points cover the entire frame. 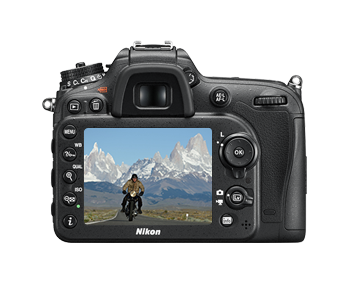 With video features inherited from Nikon’s professional cameras, the D7200 is a highly capable moviemaking tool. The camera records Full HD movies at up to 25p/30p, or you can switch to 1.3x crop mode and record at up to 1080/50p/60p. A dedicated movie menu lets you store all movie settings in one place, and footage can be recorded to the dual SD memory card slots, or simultaneously output to an external recorder or monitor via HDMI. You can shoot with Auto ISO control in M mode in order to transition smoothly between dark and bright areas, use Zebra mode to see exactly where highlights are blown, and apply the Flat Picture Control setting for easier colour grading in post-production. And because sound quality can make or break a movie, the camera boasts advanced audio controls that let you select the sound range (wide/voice), and reduce wind noise when recording with the built-in microphone. When recording with an external microphone, Nikon’s new optional ME-W1 Wireless Microphone is a superb way to enhance the power of your video footage with clear audio recorded directly from the source. Both the microphone transmitter and receiver capture sound, so audio can be recorded via the microphone alone, or via the microphone and the receiver, making it easy to record just your voice, focus on your subject alone, or record a two-way conversation. The D7200 is Nikon’s first D-SLR to include support for NFC (Near Field Communication), in addition to Wi-Fi. To transfer photos to an NFC-compatible smart device, simply touch the D7200 with the device and you can transfer the image that’s showing on the camera’s LCD screen. Alternatively, use the built-in Wi-Fi to upload impressive photos via a compatible smartphone or tablet. Simply download Nikon’s free Wireless Mobile Utility app to your smart device first1. The built-in Wi-Fi function also lets you capture images remotely via your smart device, making it easy to position the camera to shoot from various vantage points. To take further control over wireless shooting, use the WR-R10 Wireless Transceiver and the WR-T10 Wireless Transmitter, or control your camera settings with the WR-1 Wireless Remote Controller. To connect to Ethernet and wireless LAN, use the optional UT-1 Data Transmitter together with the WT-5 Wireless Transmitter. 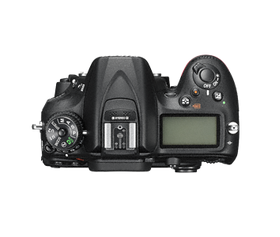 A range of features harness the power of the D7200’s core technology, ensuring you’re free to experiment and get as creative as you please. When shooting, the 8.0-cm (3.2-in. ), 1229k-dot colour-tune monitor lets you push the colour balance and brightness in any direction to suit your personal preference. The viewfinder boasts an organic EL display element for a bright, high-contrast information display with low power consumption. Whether shooting stills or video, Nikon’s second-generation Picture Control System provides invaluable tools for control over sharpening, contrast, brightness, hue, clarity, and saturation. For ultimate freedom in post-production, the Flat setting will retain all the details and preserve rich tonal information in both highlights and shadows. The Clarity setting lets you precisely adjust contrast to differentiate fine structures. Additional creative features include the option to shoot time-lapse sequences with smooth exposure transitions through simple menu operations. And you can create spectacular light-trail photography by shooting in continuous release mode with a shutter speed of 4 seconds or slower. Simply record as many images as your media cards and battery life will allow. Shoot with the D7200 and you have Nikon’s full range of DX-format lenses and a wide range of FX lenses at your disposal. With their exceptionally high resolving power, NIKKOR lenses are renowned amongst professional photographers in every field. The compact size of DX-format lenses is a real advantage when you want to travel light or shoot telephoto. In fact, shoot in 1.3x crop mode and you can extend the telephoto effect of a DX lens by 30 per cent. For creative flash photography, the D7200 is compatible with a range of Speedlights from Nikon’s industry-leading Creative Lighting System. Thanks to the commander function on the camera’s built-in flash, you can wirelessly trigger and control up to two groups of Nikon Speedlights. Attain more balanced images in tricky lighting situations with a compact flash like the SB-700. For movies or close-up still images, try the SB-500 with its on-board high-intensity LED light.